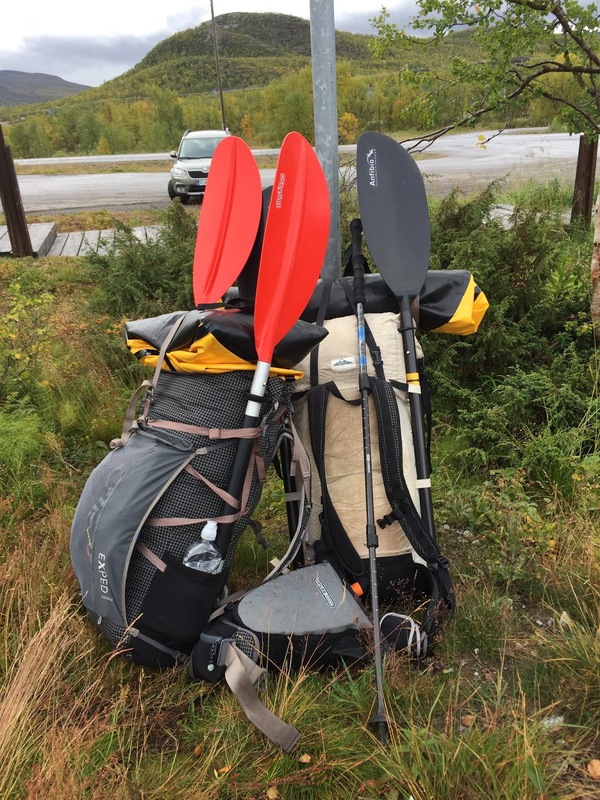 We had been deliberating getting away in September and I’d just taken delivery of my new packraft – an Alpackaraft Yukon Yak – when I noticed @korpijaakko was advertising two spare spaces on his week long hike/packraft trip across northern Lapland – starting in the far north-west of Finland and heading wast into Norway. Several helpful emails later we confirmed our places to find the other two clients had dropped out so we would effectively have a Jaakko as a private guide for the week. 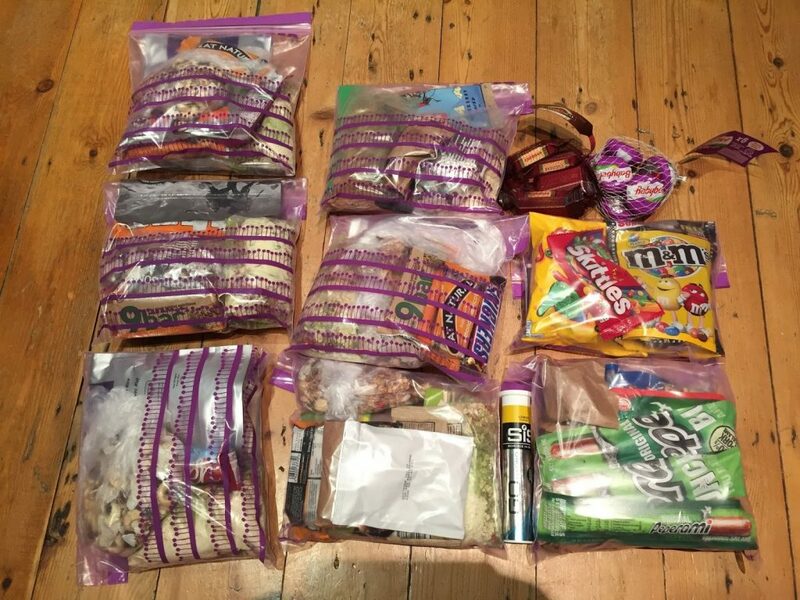 Cue a couple of weeks hastily organising gear – finally managing to get hold of his and hers Exped Lightning 60 packs – as well as organising food rations. I had been pondering choice of shelters, my girlfriend not over-enamoured with the idea of us both squeezing to my one-person Hex Peak mid. I had been offered the lone of couple of shelters (thanks @outdoorsMH and @vkemec) but at the last minute I ordered a Lux Hex Peak F6 – a larger version of my Hex Peak, which was promptly dispatched from Backpackinglight.co.uk. Jaakko was incredibly helpful with travel logistics, weather forecasting and sanity-checking gear lists and random questions. 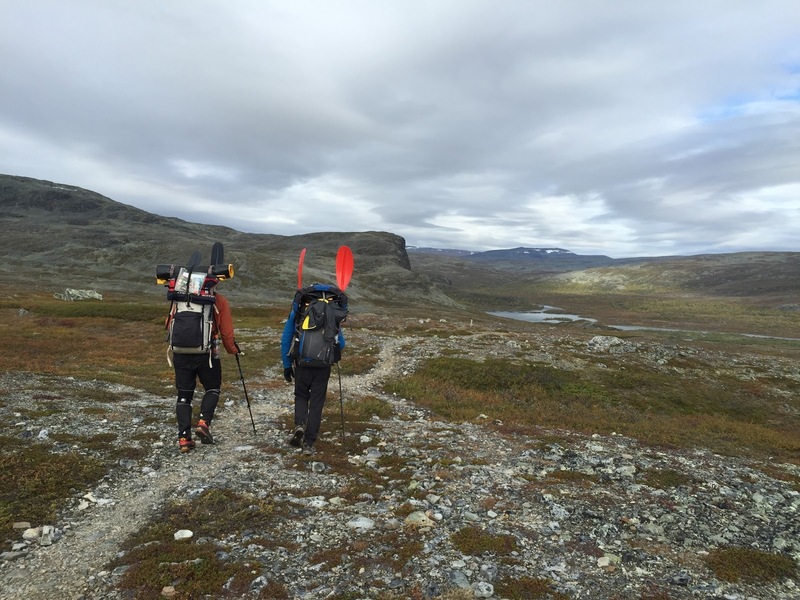 Erik the Black’s gear spreadsheet was handy for checking stuff off and reckoning our weight. Leaving Heathrow at a leisurely 1020 on the Saturday we flew to Helsinki before boarding an internal flight to Kittilä some 1,000 km north, to be met by Jaakko, whose stature and beard meant he wasn’t to be missed! After chomping down the worlds largest ‘regular’ pizza we headed to a nearby log cabin for the evening, spent sorting gear and enjoying a traditional sauna. 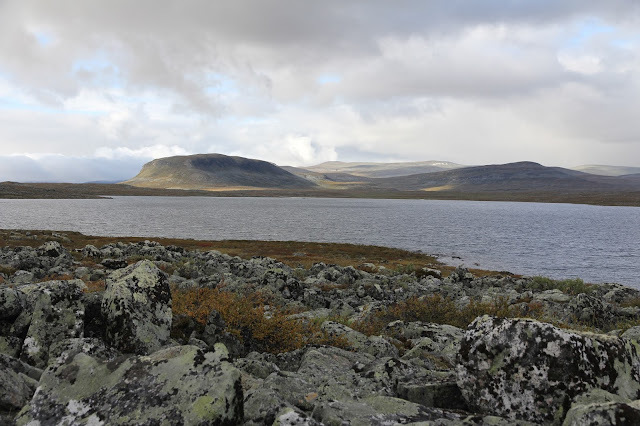 We rose early for the three and a half hour drive from Kittilä to Kilpisjärvi during which I filled in my knowledge of Finland, its mountains and history, between bouts of slumber. I was surprised to hear that Finland has only 26 peaks over 1,000m, with the highest Halti being 1328m. Kilpisjarvi felt like a distant outpost, which indeed it was, though the local outdoor shop opened at 11am so I could grab a couple of gas canisters for the Jetboil. 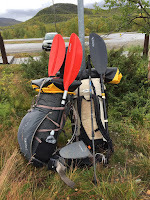 We parked the car and spent a nervous few minutes checking we had everything, shoving in an extra layer as the weather had turned wet and cold. 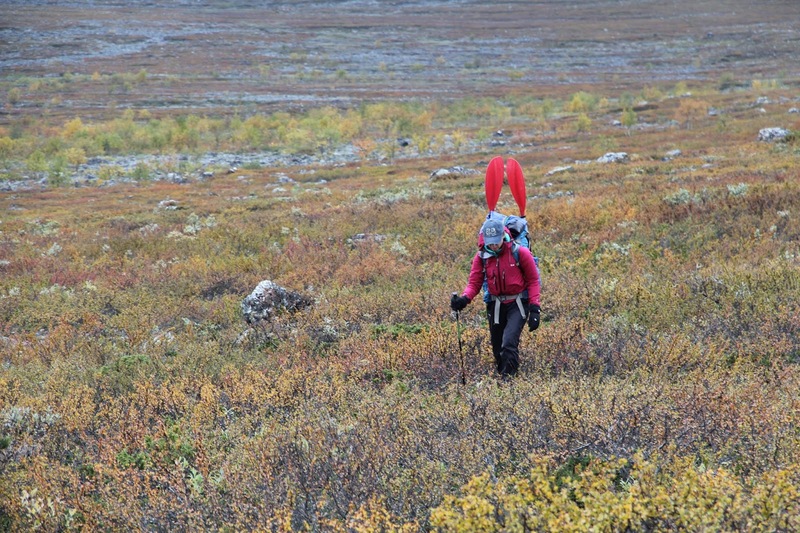 Finally we shouldered our packs – fully laden we were around 20kg – and trudged off up the path around 1230. 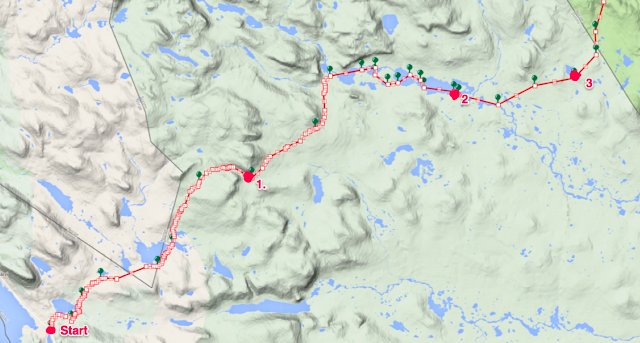 Today was to be longest day – over 20km – which coincided with our heaviest pack weight. 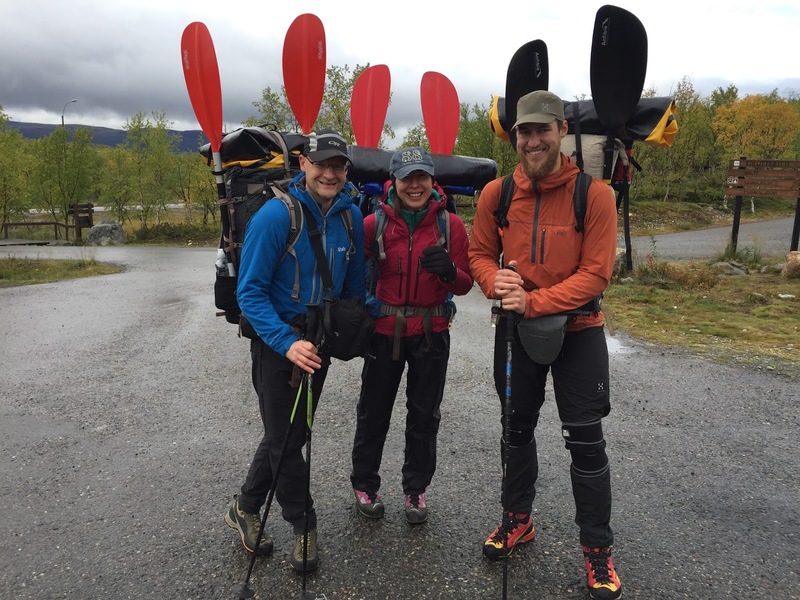 The first part of the route followed an established route north-west, crossing the border with Norway for a short time before heading back in to Finland. 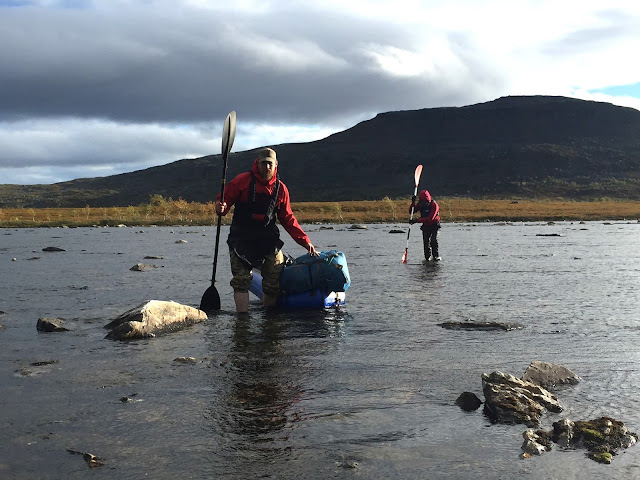 A combination of the pack weight and a path that alternated between rock-hoppping and bog-hopping meant it was hard-work, especially after the early start and long drive. As we gained height the trees had thinned out to mainly dwarf birch until even they petered out. Our first wildlife was a few lemmings scurrying under some duck-boards across a boggy patch. Shouldn’t they be at the coast throwing themselves into the sea….? Finally we reached a small open hut at Saarijarvi and at 4pm it seemed an opportune time for a late lunch. From here we continued gaining height, the feint path shown by marker posts every 20m or so. The view and the sky just opened up to give our first real taste of taste of the scale of the wildnerness into which we were heading. The path seemed to go on for ever and the packs seemed to be getting heavier as we continued to head up over a rocky pass before eventually started a long descent into valley. 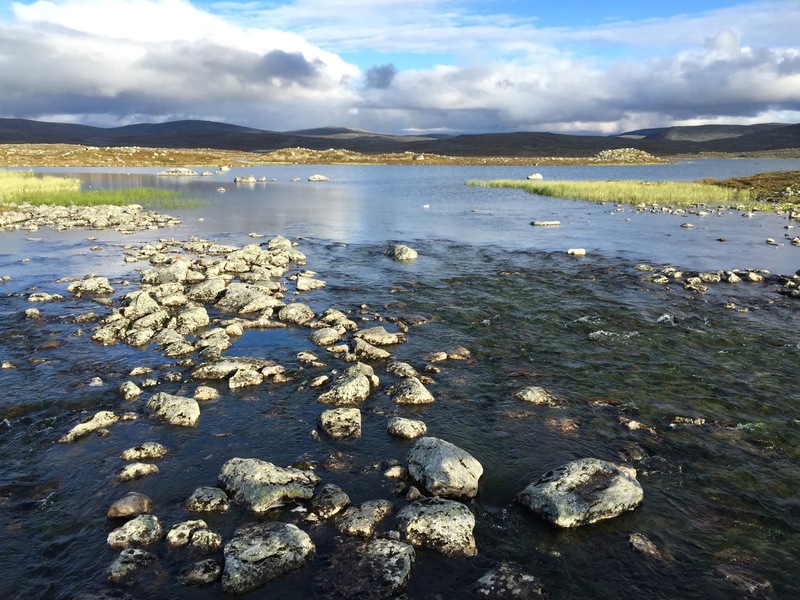 We had to cross a small river and as the only one without waterproof boots I carefully picked my way across some stones, only to slip on the final step and fill both boots with icy cold water. 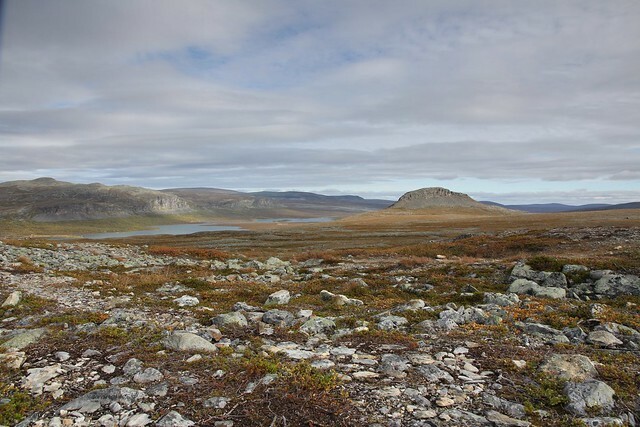 Some 20 mins later the small hut at Kuonjarjohka came into view, replete with tiny outhouse. A few small tents were scattered around – mainly Hilleberg – but it turned out no-one was staying in the hut so we were free to use it. Jaakko wanted to try out a Locus Gear eVent mid he’d borrowed so he pitched up by the river as Ali and I sorted stuff for dinner. 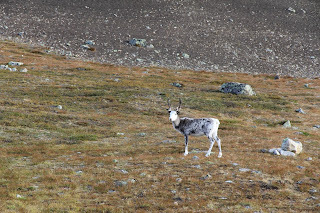 An inquisitive reindeer has us scrambling for the camera, just before we tucked into a venison dinner. Several of the Finnish huts have two halves – a reservation side to be booked in advance and an open side that’s first come first served. They’re surprisingly well equipped including chopped wood for the stove and several have been recently equipped with gas stoves. Stove on, meal rehydrating and we were soon snuggled into sleeping bags after a long and tiring day. 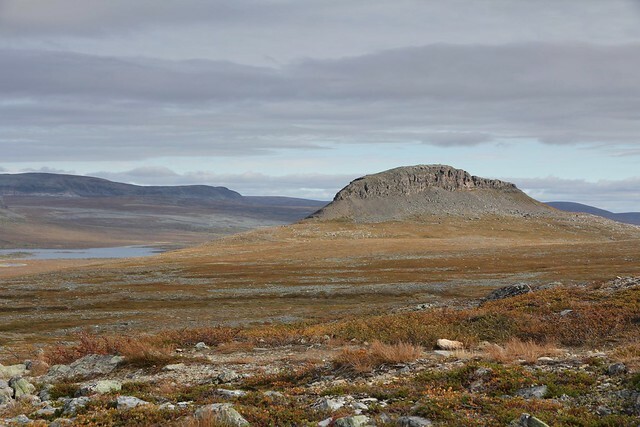 A clear morning saw us heading north gaining more height until what appeared to be the whole of Lapland stretched out before our eyes. The last remnants of snow clung to the north-facing ridge behind us but before us lay miles and miles of untouched wilderness. The stream that ran past last nights camp squirmed its way out on to a vast plateau, a couple of the lakes that were to be our destination stretched themselves out in the distance. In the distance on the horizon was another ridge that marked the watershed into Norway we’d be aiming for in a few days time. 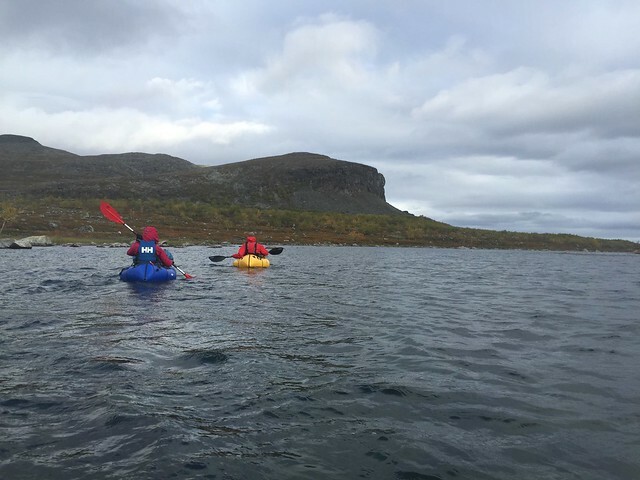 Gaining further height we dropped over a ridge to see the profile of Saivaara Caivarri – a kind of miniature Finnish Suiliven – rising proudly from the plateau, flanking the string of lakes along which we would be packrafting. The light was kind and as we approached Meekonjärvi at the west end of the lakes we lunched by some fishing huts while admiring a rainbow. It was finally time to take advantage of the extra weight and inflate our rafts. A few minutes later we’d lashed our packs to the bow were finally on the water- this is what we were here for. The sunshine was punctuated by dark clouds which threatened and added to the sense of fragility in such a emote landscape. The wind whipped up a few small waves but was thankfully in our direction. 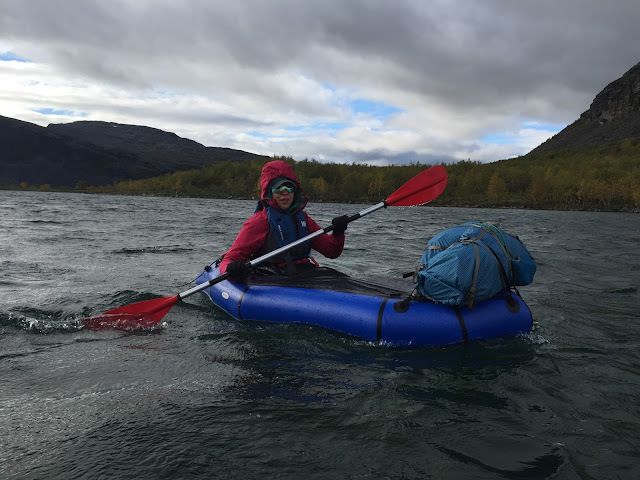 Our route was actually along a string of long lakes, each joined by an outflow that dropped a few metres, though the low water level meant we were pushing and scraping across rocks A couple of times we were forced to step out, drag our boats to the shore and navigate between them on foot. After at the end of the third lake we could see the small hut at Porojävri that Jaakko had pre-booked at the last minute. 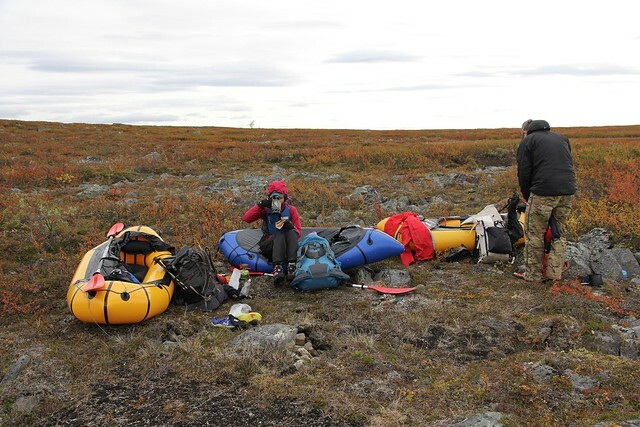 With two bunks, a wooden stove and a small gas stove we were set for the night and being able to dry our gear. Back on the water the wind was a little stronger and waves a little higher, but thankfully not against us. 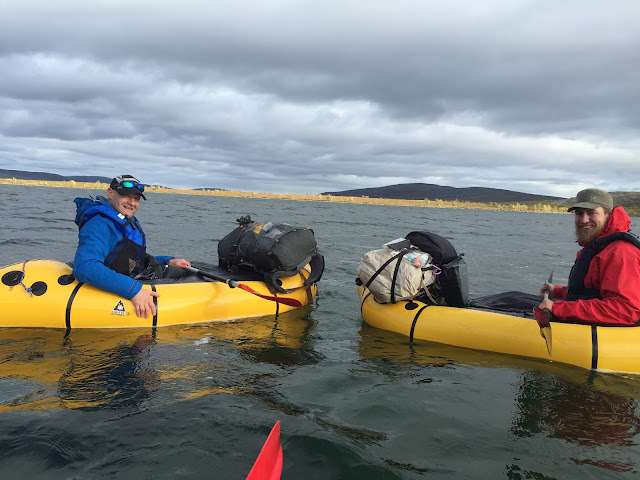 Negotiating another outflow, a couple of shoves of the paddle saw us over a few rocks and into the next channel. Eventually we joined a larger river but it was time to get back to hiking. Landing in a small bay we dragged our rafts over the dwarf birch and grabbed some coffee and lunch before re-packing and heading east on foot. 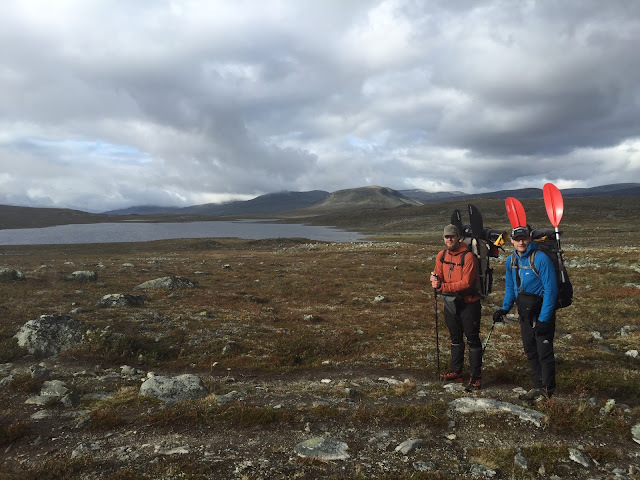 With no paths the going was tough – we were traversing ground that was higher to the north so were continually rising and falling, crossing each minor water course that meant tramping through bogs. Eventually I’d recognise that dwarf birch giving way to mini birch and willow indicating the next boggy bit. The sky darkened and drizzle added to the sense of desolation as we looked back to the peaks we;d left we could still see remnants of the last winter. To the south a plateau stretched out, riddled with rivers and lakes. Ahead of us the ground undulated with just more birch and bog to negotiate. We continued contouring, the monotony of birch-bashing, occasionally interrupted by boulder hopping over old stream beds. “How far?”, “Are we there yet?”, “..it must be over the next crest”. we questioned Jaakko. We longed to see the tiny hut that marked the end of the day but each time we peered over the next crest we saw just more scrub and birch. Eventually a dot appeared and after hopping across a river we reached the hut at Harrejavri. Again it was empty so we made full use of the wood stove and a sleeping platform. 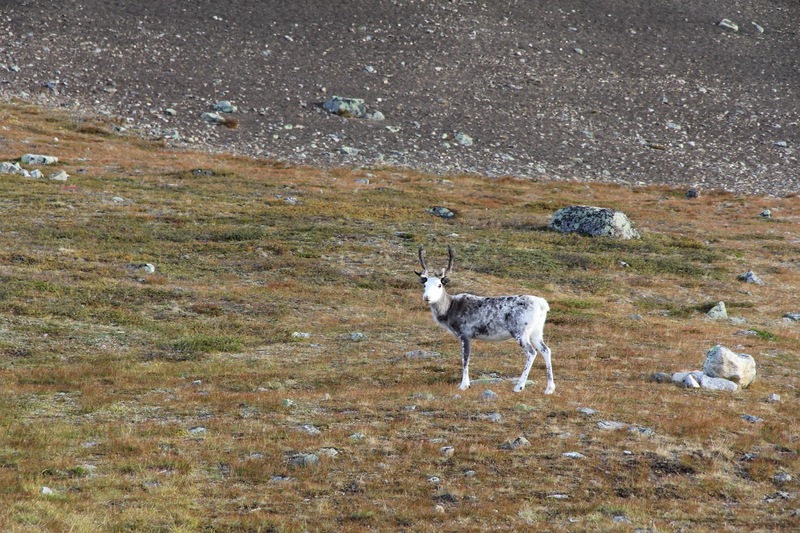 It had been a couple of days since we’d seen anyone else – we were truly in the wilderness. For more photos see my album on Flickr here. For a map of our route see below. Route of first 3 days from start at Kilpisjärvi.